Technically, bakeries have to get permission from the copyright holders to use certain logos in their cake designs. But really, who has the time or energy for that? ...when it's essentially just a red "S" on a yellow triangle anyway? Totally the same, AND free for anyone to use. Come to think of it, you really don't even need that triangle; a yellow background still gets the idea across, right? A "super" cake, for a, er, "great" man! This one could fool just about any lawyer: a playing card and a friendly Halloween bat? Nope, no Batman stuff here! A very "serioust" clown, that is. "Now, Pat, we've got to make sure that 'Bat' and 'Man' are two separate words, okay? And obviously no bats." "Nooo problem, boss. How do you feel about seagulls?" Jessica T., Eddie, Jill M., Aileen M., & Maria, "super" job! I'd like to see their versions of "Barbie" cakes. i like the random capitilization on the bat man cake, along with the prissiest letter b ever seen on a grungy slab of granite colored cake. why cake gods...why?! 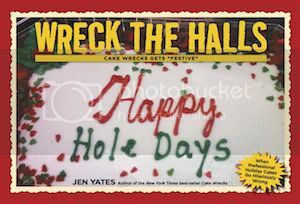 I love Cake Wrecks! On a side note I just received my copy of the book and I couldn't stop laughing (or cringing). Ok seriously! The last one!!! Facepalm! They must've been smokin' some fondant to think that cake was even presentable to the public! Let alone a kid... "Gee, thanks mom, I love the color gray?" UGH! I just loved that Joker cake. There's no way in hell to know what it's supposed to be, unless you're given a clue. And then it's like a light bulb switching on in your head! AAAH, IT'S JOKER! I didn't snap a picture yesterday, but these remind me of the cake I saw with the blue Hulk. I could've sworn Hulk was green. Spelling aside, I secretly think the Joker cake is pretty sweet. Looks like (a crazyperson) he made it. Ok ok ok I snorted and starting giggling really hard at the "Serious? HA!" cake. What the H-E-double hockey stick? 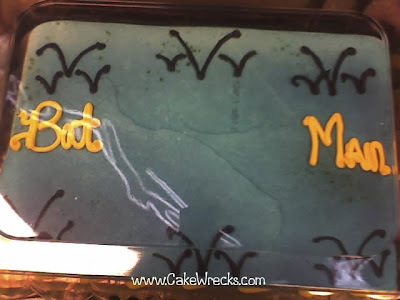 I also enjoy the seagulls on the Bat Man cake. I see some very angry children destroying that thing. At least the handwriting on the first Batman cake is okay..
OK, so I'll admit I haven't seen the recent Batman films, but I was the last one *really* something to show to a FOUR-YEAR-OLD?! wv: seebran - strange, I thought you were supposed to eat it. The logos in the corner of the first one look good, though. And I never would have gotten the Joker cake without reading the comments. I'm mostly horrified that a kid getting a cake themed around The Dark Knight for his 4th birthday. That movie is in no way appropriate for a kid who was 3 when it came out! "Why so serious? Dominic is 4!" AAAAA! The terrifying V formation! Yes, I'm with the folks who think that the Dark Knight's Joker is just a few decades too mature for a 4-year-old. Seriousness itself is too mature for a 4-year-old, let alone sarcastic use of the concept. It was great to see you both in Chicago last night! I asked Jen to sign "HUGE ME" in my book! Thanks, guys, for the fun! is ray 37? i used my super powers to deduce that he must be: a number 3 candle + 7 single candles = 37 years. interesting (and kinda sweet) that a man pushing 40 wanted a superman cake. awwww. You want Superhero cake wrecks. Watch Superman 3 and stop the movie when they zoom in on the cake at Lana's Boy's birthday party. The cake is just a touch away from a wreck or one outright. To be fair it is probably actually a block of shortening rather then an actual cake. It wasn't a Superman logo! Poor Sray, no one ever gets his name first thing. Did anyone else notice that on one cake there are 7 normal candles, and a big "5" candle next to it?? 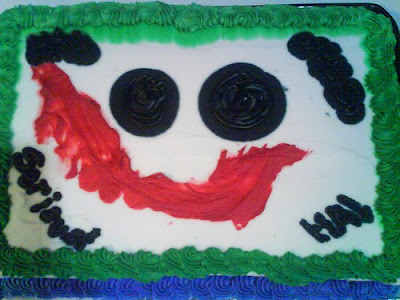 You know, I just don't think I'd give a 4-year-old a Joker cake, especially with the caption "Why so serious?" Granted they won't understand but wheee that's just disturbing. The last cake gets -10 points for the Bat....Man lettering, but the flock of bats reminds me of the very cool opening animation for "The Batman" animated show. Not too bad (at least not as bad as the others!). Awesome! Love the last one! 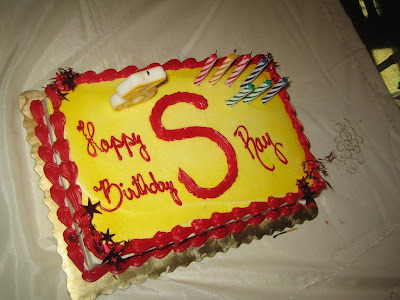 Who knew a large red letter S sitting by itself is all you need for a fabulous birthday cake? 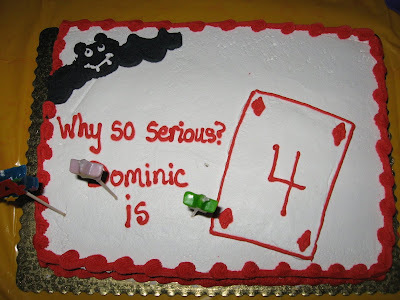 "Why so serious Dominic is 4"? Is that what they ordered, or did they just want a batman cake? I love how the card switches around the diamonds and the numbers. I just need to stare at the last one for a few more minutes to try to figure out WHAT THE HECK IS GOING ON. And the one with the playing card is like a game of Pictionary. Figure out what the cake is supposed to say with just THIS bat and THIS playing card! Kath, good eye. How could they mess up the big one when there are proper S diamonds (plastic rings) on the corners? Oh, yes. Seagulls get the point across only too well. Nope. No copy-right infringement worries here! I was thinking CW3 was, perhaps, just a bat who liked to play cards. Holy Fondant Batman! It's hard to decide which of these "super" cakes is the LEAST appetizing! Yeah. We're pretty new to this whole Cake Wrecks phenomenon... and we've just gotta ask what in the holy living Hell were these people thinking? smoking? Wow. Holy V, Bat Man. and thanks again for the laughs you are obviously "tonight's entertainment"
Anyone else notice that Ray's "Superman" cake has a number 3, but then 7 candles off to the side. Hmm... I guess only a true Superman can be two ages at once! You guys are awesome!!!! I gave you an award. These are pretty funny. I got my book yesterday - love it! i don't get what that thrid one has to dod with superman. I think that they are perfectly decent get arounds! They just get progressively worse! The serioust cake is like some child's attempt at a demon cake... with demon eyes made of... swirl. And the "Bat Man" cake just is dumbfoudingly bad. We love this blog, the way you love a bunch of pictures of deformities, but you don't feel bad for laughing. 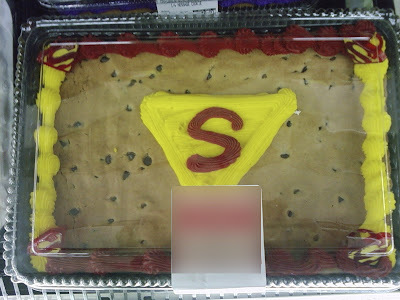 It is odd that they used the plastic shields on the first cake, er cookie, and they couldn't draw on the Superman logo right. I mean the actual thing is right there how could they not use it? Since they are obviously already using licensed stuff on it I blanking on what the problem is here. That's the big irony of cake one. The messed up the Superman Logo while using the LOGO!!!!!! why is part of the superman cake blurred out? Man, I'd love more wrecky and non-wrecky Superman cakes. Or Batman. No, he's been getting all the glory. I guess for others this is not a big deal. as long as they are cakes and they are delicious and you are starving, nothing to worry! I would love to see what these Wreckerators would have done with a Two-Face cake. Oh my god. That last one kills me. That clown is just creapy. Hey all, I'm the 4 year old's mother- I can assure you he did not see "The Dark Knight". He just happens to love Bat Man and the Joker! No emotional scarification done, I promise. Honestly he could have cared less about what his cake looked like, he was in it purely for the presents. Thanks for the concern! I didn't read all comments so forgive me if I am repeating. I have an explanation for the grey Bat . . . Man cake. A plastic decoration goes in the center, but it has to be sold separately. My wife ordered a "WALL-E" Cake for my son that looked similar. Some blue, some brown, some words, some random bits of icing. Then they sold us a plastic Wall-e and Eve "separately." Once they were positioned on the background of the cake, the whole thing . . . well, looked like crap, but the boy enjoyed the plastic toy and ate the cake. I love the generic Superman symbols. Bravo! I kept turning my computer screen until I realized I still couldn't get a good angle on how old Ray is.